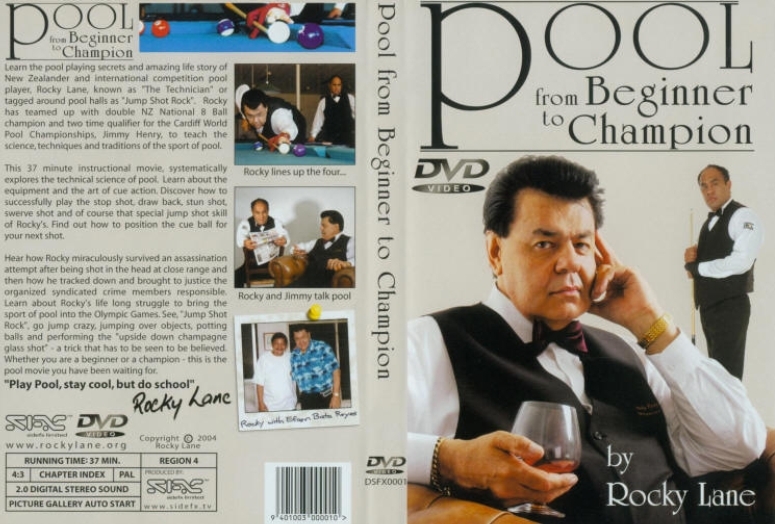 We are very proud to announce the very popular release of Rocky Lane's amazaing new instructional DVD movie entitled "POOL From Beginner to Champion". Rocky has joined forces with double New Zealand National 8 Ball Champion and two time qualifier for the Cardiff World Pool Championships, Jimmy Henry, to teach the techniques and traditions of the sport of pool. The DVD includes an exclusive insight into how Rocky performs those amazing jump shots that have earned him the nickname 'Jump Shot Rock". Pool pro's seldom give away the secrets of how to play a better game of pool. So, rather than spend years in pool halls making those normal "beginner mistakes", why not get the gist of the game from this movie? Steer your game in the right direction. As Rocky, himself, would say, "One must first lose many times, before the winning begins. No one becomes a champion on his first day." Learn about Rocky's life long struggle to bring the sport of pool in to the Olympic Games. See 'Jump Shot Rock' go crazy. Jumping over objects, potting balls and performing the 'upside down champagne glass shot'. A trick that has to be seen to be believed. Done in Auckland, New Zealand. Evidence taken by TV3 - New Zealand. Beginner or Champion - This is the pool movie you have been waiting for. Why not order some as a gift for a friend, your children, or your pool students? Jump Shot 15 pool balls over a two inch high rail and pot all balls within 14.16 seconds. regardless of the number of copies ordered.